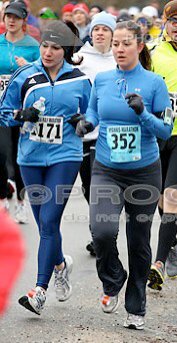 This coming Sunday one of my favorite running buddies , Liz, will embark on her first full marathon, the Providence Marathon! Liz was originally supposed to run NYC last November, but due to a late injury she was unable to compete. The frustration of having to sit out a marathon after MONTHS of training is unfathomable. In my running “career” I have never personally been faced with the decision to run and risk permanent injury or sit out. If this were to happen to me, my guess is that I would become depressed and give up on competition altogether for a few months. Well, the fighting spirit and desire to challenge herself never left Liz, and the depression never set in. She gave herself time to heal (cross training all the while), and then launched straight into marathon training, probably not something a doctor would recommend! Now she finds herself just DAYS away from her first marathon, GO LIZZY!!! Please check out her post about her pre-race jitters and thoughts, and please wish her GOOD LUCK!